The reason that my photography intern and I decided to use virtually the same exact picture for this entry as entry #18 in this series (outlining powdered laundry detergent) is because the two recipes are very similar. 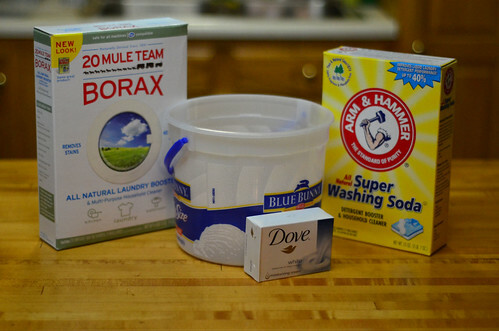 Just simply mix together one cup of borax and one cup of baking soda or washing soda in a tub. If you wish, you can add a small bit of OxyClean to the batch or a small bit of store-purchased dishwashing detergent – you need one or the other to act as the active detergent ingredient if you’re washing any dishes that are fairly dirty. All you need is a tablespoon or two of this stuff (depending on the size of your dishwasher) to get things fairly clean. If you want to replace the “finishing” liquid (Jet Dry, for example), just use a tablespoon of vinegar. There’s no smell – just shine on your dishes. There’s a theme worth noticing here. Between the two recipes, we’re using borax, baking soda, washing soda, OxyClean, a bar of soap, and vinegar. I also keep some club soda These ingredients together manage to clean laundry thoroughly and clean dishes thoroughly. If you carry that thought out to its logical conclusion, these ingredients can pretty much clean anything in your home thoroughly. For example, when I’m cleaning windows, I fill up a spray bottle with one part vinegar to two parts water, with perhaps a tiny amount of another cleaning agent (whether it’s dish soap, borax, or something else). I stir it thoroughly, then head to the windows. If I’m washing dishes by hand, I make a bit of paste out of borax, washing soda, and water, then just use a tiny amount of this on a sponge to clean almost any dish I have. If I’m facing a carpet stain, I put some baking soda on the spot (a teaspoon or two), spread it thoroughly into the spot, then pour a couple teaspoons of vinegar on top. There’s a fair amount of foam, which I then scrub into the spot. If there’s a dark stain on clothing and I see it immediately, I put some club soda on it. If I have any acne (I often did in my twenties, but haven’t had any in a while), I make a paste out of baking soda and water and put it right on the spot before I go to bed. Heck, if I want to whiten my teeth at home, I brush with baking soda and then use a bit of vinegar while brushing. If my stomach feels out of whack, I usually put a bit of baking soda in a glass of water and drink it (I usually burp like a madman for a while, but my stomach feels better). I could keep listing things, but the truth is that most home cleaning tasks and even other simple things can be handled with some combination of the ingredients listed above. The best part? Those ingredients are cheap. I can get a giant bag of baking soda or a jug of vinegar at my local warehouse club for a very low price. Even things like borax and washing soda are pretty inexpensive at my local Fareway. Why use a product with a brand name and an expensive price on it when homemade mixtures like these will do the job?